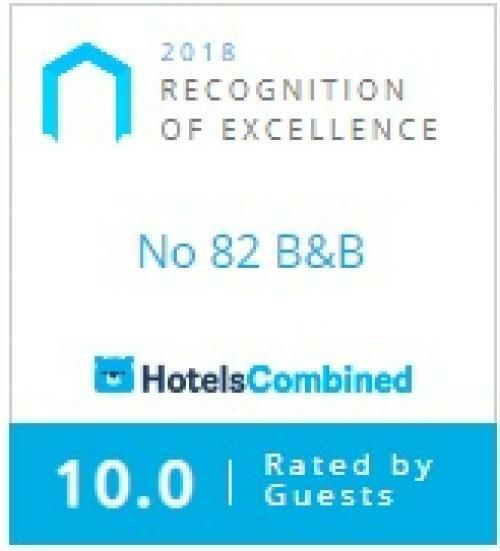 Welcome to No.82 B&B Your Home from Home, the family owned and operated boutique B&B providing luxury accommodation in Stratford Upon Avon. Each of the two spacious guest rooms is lavishly furnished and decorated with its own charm and distinctive style, offering all the comfort of a luxury hotel combined with unique features to create a Home from Home experience for our guests. At No.82 B&B we are passionate about customer service. When you stay with us you can expect a warm welcome and the highest standard of hospitality. We pride ourselves in our local knowledge and will be delighted to help you plan your stay. No.82 B&B is situated in the quiet, historic and picturesque Shottery area of Stratford Upon Avon, home to Anne Hathaway's Cottage. A 10 minutes leisurely walk from our property brings you to the town centre featuring the world famous Royal Shakespeare Theatre, shops, restaurants, Shakespeare's houses and the many other attractions that Stratford Upon Avon has to offer. The famous Stratford Race course is less than 15 minutes walk from our door step. We are 11 minutes walk from the rail station and 5 minutes away from the lovely local pub serving great food. Parking can be tricky in always busy Stratford Upon Avon. We offer on site complimentary parking, so our guests can ' park up' and forget the car when staying at No. 82 B&B as most of Stratford attractions and restaurants are within walking distance. Our buffet style breakfast has a reputation amongst our guests for it's size and wonderful variety. We accommodate lactose and gluten intolerances as well as vegetarian diet. Notice in advance would be much appreciated. Thank you. The Master Suit is located on the first floor of the main house. Extra spacious, light and airy bedroom looking onto the lovely sunny garden. The room decor is very similar to the Annexe style but has its own distinctive character. The Master Suite offers many extra touches designed to make your stay comfortable and relaxing.